You mention Siddham Sanskrit. Siddham Sanskrit is the language and alphabet of Mahayana Buddhism. You can do a search and you will see the Siddham alphabets compared to the Devanagari. Thank you, Saddha, for the comment. Yes; the Siddham script is a descendent of the Brahmi script and an ancestor of the Devanagari script. 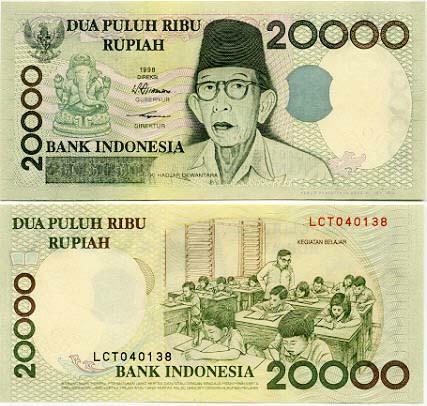 The script is a refinement of the script used during the pre- Gupta Era. It could even be called the older form of Sanskrit script as we know it today. The name Siddham comes from Sanskrit; and it means ‘accomplished or perfected’. There came into practice the writing the word Siddhaṃ, or Siddhaṃ astu (may there be perfection) at the head of documents. In India, Siddham was replaced by Devanagari script. But, Siddham has survived in East and Far East mainly because it was the earliest vehicle for spread of Buddhism in those areas. In the early years ( say up to the ninth century) when Chinese scholars travelled to India for studies in Buddhism, they would invariably take back with them the copies of the old Buddhist manuscripts in Siddham script. And, when it came to translating those texts to Chinese they considered it important to preserve the purity of the pronunciations of the mantras. But, since the Chinese was not suitable for writing the sounds of Sanskrit, the scholars of those days thought it fit to retain the Siddham script. This led to the practice of using Siddham while copying Buddhist texts in China, Japan and Korea. An adaptation of the script is still used in Japan, where it is called Bonji. It is used for copying the Mantras and Sutras. In China, the series of cultural purges put an end use of Siddham script. 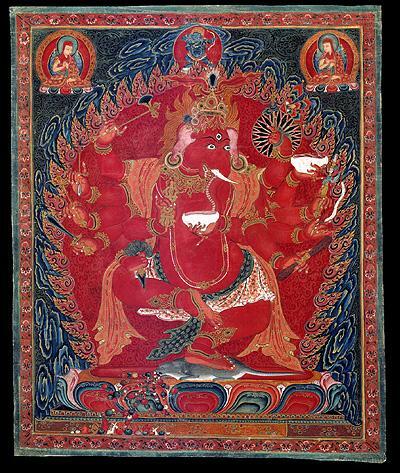 But, it survives somehow in East and Far East Asia where Buddhism particularly the Tantric Buddhism is still alive. Dear Web, You are welcome. The content (text and pictures ) are mine. Dear SreenivasRao, Please quote me the manthra from upanishads, that you stated as “Taittariya Aranyaka (10.1.5) which appeal to an elephant faced (hasthi-mukha) , single-tusked (dantin) deity with a curved trunk (vakra tunda)”. This kind of god is not truth and is only a creation of human mind in later periods of puranas. 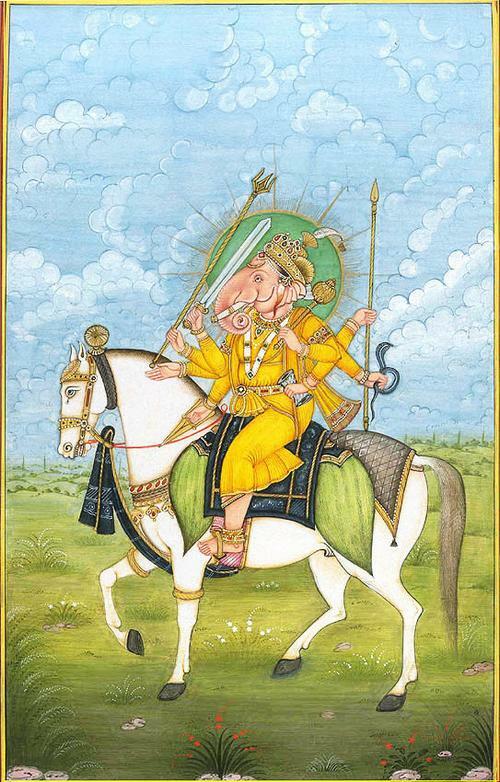 Vedas nor Upanishads describe Ganesha having such elephant face, riding on a rat, having lambodaram. A similar Gayatri appears in Maitrayani Samhita of the Krishna Yajurveda. The Great Vedic scholar Sri Sayana-acharya in his commentary on Taittiriya Aranyaka identifies identifies this deity with Ganesha . 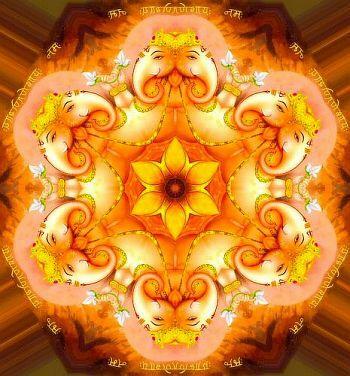 Ganesha is conceived as an embodiment of all elements . The earth – the gross element – is represented by a rectangle forming the base on which Ganesha is seated. 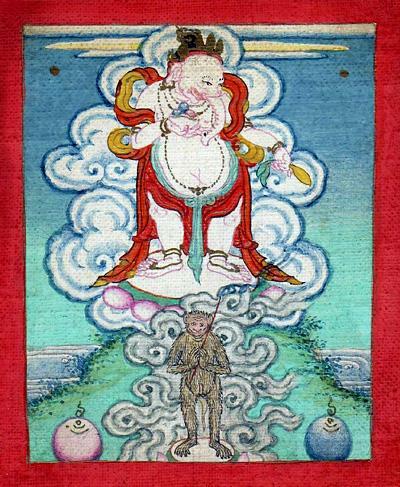 Water is represented by his round belly; fire by a triangle: his tusk , mouth and upper trunk ; the air by a crescent ( his third eye) ; and , the space by a flame ( his true self). 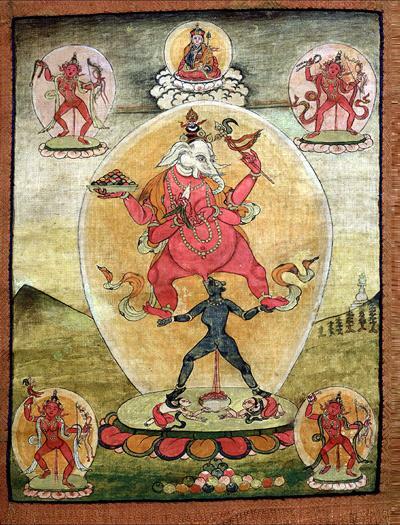 Further , in Tantric worship , Earth is represented and controlled by Shiva; the Water by Ganesha; the Fire by Shakthi ; the Air by Surya; and , the Space by Vishnu. i heard it from my father… the writing of my great grand father neelakanta shastry is lost alas..
though the essense remained in our understanding…. thank for your illuminating comments. 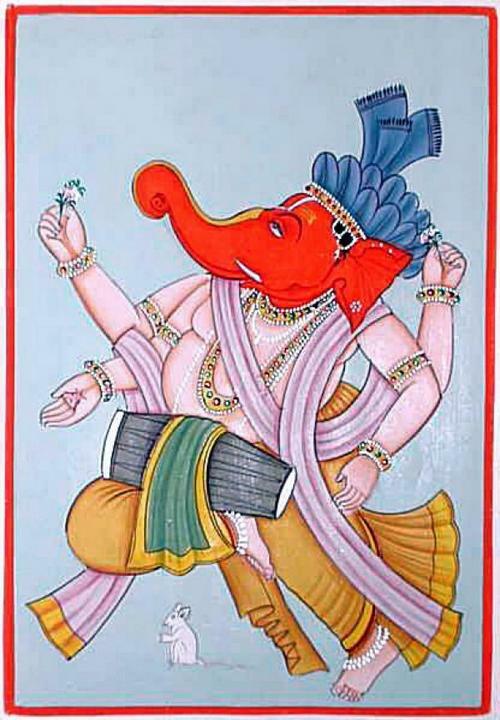 i was vaguely aware of the significance of 21 associated with ganesha; but it didn’t strike me to mention that (in my post on ardhanari too). i didn’t know about association of 3 with brihaspathi. thanks for mentioning. regarding ganapathyam, in the first instance i mentioned it as a phrase to indicate shiva’s hordes rudrasya ganapathyam. i again made a reference to ganapathyam as a doctrine that developed by about 7-8th century. 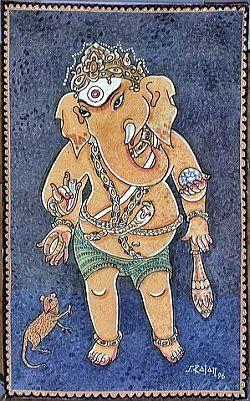 i understand that ganapathyam venerates ganesha as the ultimate reality. but, i am not quite conversant with its principles and practices. what you said about mother-influence to en- charge and hold the community together is very interesting. 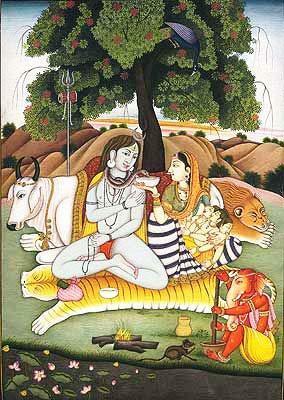 coming back to ardhanari – ganesha, did you check the picture of ganesha in ardhanari’s arms? it is picture of around 16th century. you occasionally refer to your ancestors, who were men of great learning. you could , at sometime, consider writing about them, briefly. that would be great. 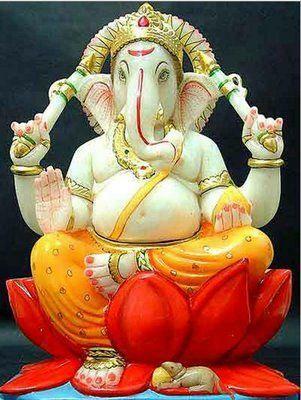 wish you a happy ganesh. 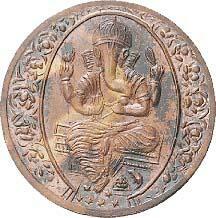 Your writing on Ganesha is very interesting, especially how other countries have used this icon. I thought of sharing an insight I had after a session on Kriya practices with the son of Lahiri Mahasaya of Kasi. Many exercises were to raise and lower the kundalini shakthi along the spinal chakras. One was different. The energy had to be raised up to the forehead chakra, then perform a chin lock as in yogasana, and project the energy to the navel chakra and keep it tied there. The reverse process was done thereafter. Imagine a person who has practised it assiduously for long. What would his aura shape be? 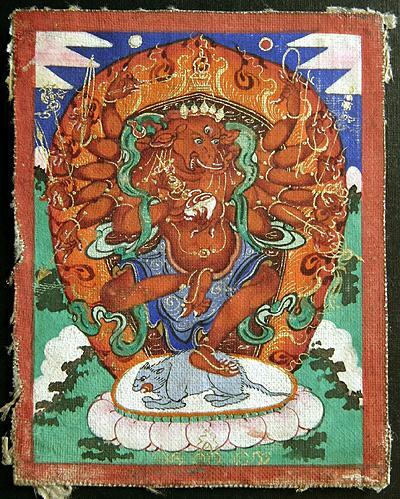 He would surely have an expansive face with the energy flowing down to his navel like the elephant trunk. These energy chanels help in the attainment of certain powers of concentration and siddhis. (Remove obstacles and be master?) Likewise the enlarged ear chakras may be the result of certain types of meditation and kriyas. 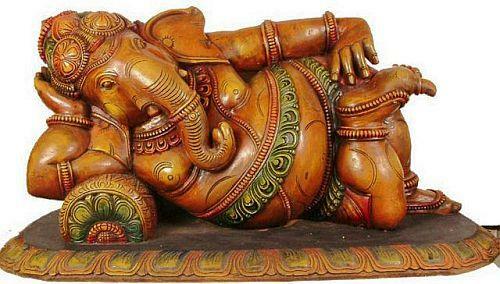 This may be the real tantric vision of Ganesha. and the fascinating truth may be that if you practise these things you may attain the likeness of Ganesha. Are we not made in his image in more ways than one? Dear raghavan, Wow..! That was very interesting; and you are truly remarkable. You have gone deep into many things. Yes, there is a close relation between Yoga and Tantra; and Ganapathi figures prominently in both the streams of Sadhana. 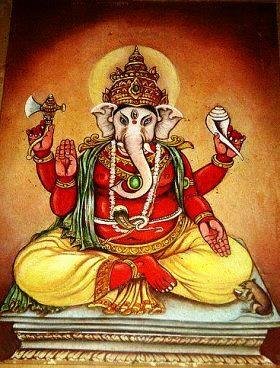 Ganapathi is regarded the synthesis of all the five elements. The earth element is represented by a square; the water by circle; fire by triangle; air by half-moon; and space by Bindu (point). It is said all these features can be found in the form of Ganapathi. 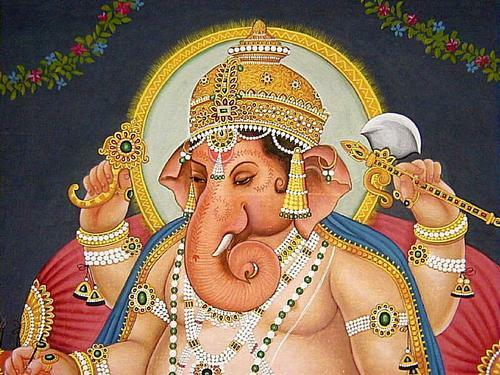 Further, if his tusk is Om-kara; his belly the great space; the serpent around his belly the Kundalini enclosing all; his rat the Rajo-guna; which Ganapathi controls riding on it. Yes, as you said , we are made in his image. Thank you for an insightful comment. I was trying to figure out how all the shapes , square, circle etc. can be found in Ganesha. In a stylized depiction perhaps. Any help on this? So wonderfully researched, Srinivas Rao…thank you for giving me such a lovely insight into my favorite deity! I would like to correct the explanation for the tamil term-PILLAIYAR. 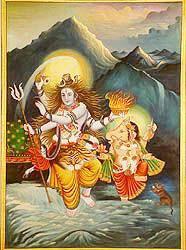 The first meeting of Shiva and Ganapati was at warfront, with Ganapati trying to prevent shiva’s entry into his house as per his mother’s instruction. 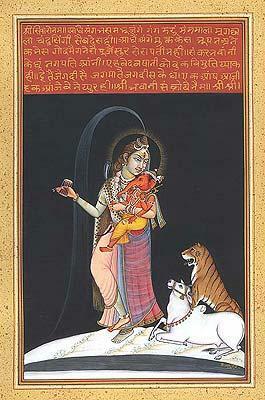 After his head is scooped off, parvati comes running out and sheds motherly tears. Parvati is taken aback at this question and says- He is my son! Everything is at a standstill for a moment and pillaiyar becomes pillaiyar’s name. My understanding of this story is that when the husband is away, it is natural for a woman to feel lonely and beget a child(sometimes). And no matter whow the child is born, the husband ought to accept it as his son too. That is how I summarize “PILLAIYAR”. Of course, traditionalists would find it unacceptable. I always thought Hinduism gave enough respect for inevitable natural instincts. At the outset I beg your pardon for the delay in responding to your comment. Please excuse me. I was away; and, my health had also been rather inconsistent. 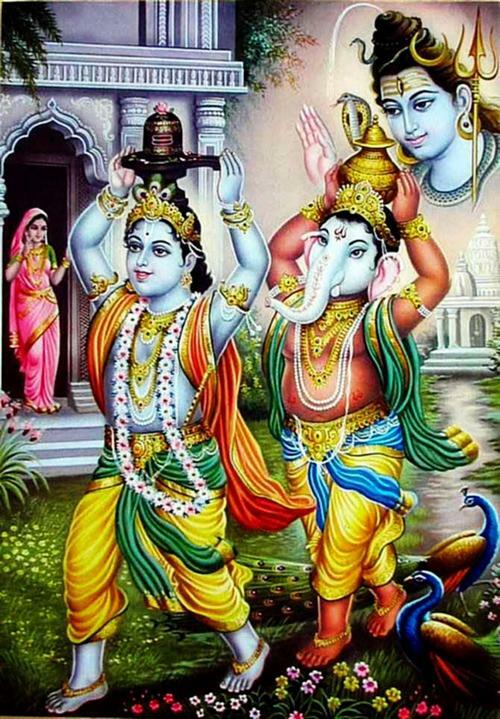 I presume you have read my articles regarding the Origins of Ganesha Worship ; and , Ganapathi, the lord of the ganas . These cover a number of issues that might interest you. 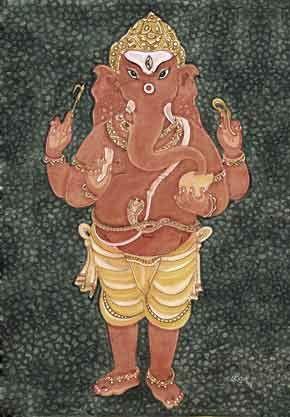 Ganesha, as we know and worship, does not, of course, figure in the early Vedic texts (Samhita). The Natyashastra (dated around second century BCE) begins with salutations to Pitamaha (Brahma) and to Maheshwara; and, the gods worshipped therein are basically the Vedic deities, such as: Sakra (Indra), Varuna, Vayu, Kubers, Surya, Vishnu and Sarasvathi. There is, however, no mention of Ganesha /Ganapathi. 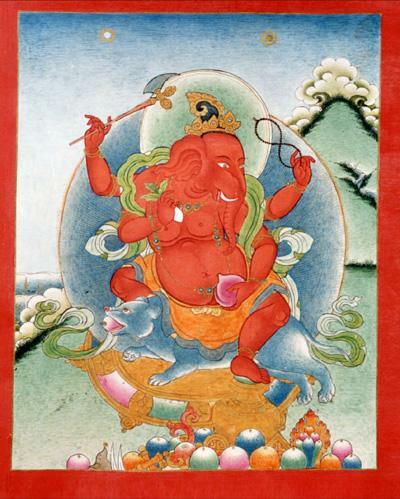 From what little I have read, the scholars seem to think that the four or six Vinayaka-s mentioned in Mānava-Gṛhyasūtras and the Yajnavalkya Smriti were later rendered into a single Vinayaka; and , appointed by Rudra as the Chief of the Ganas – Gananam Adhipataye. 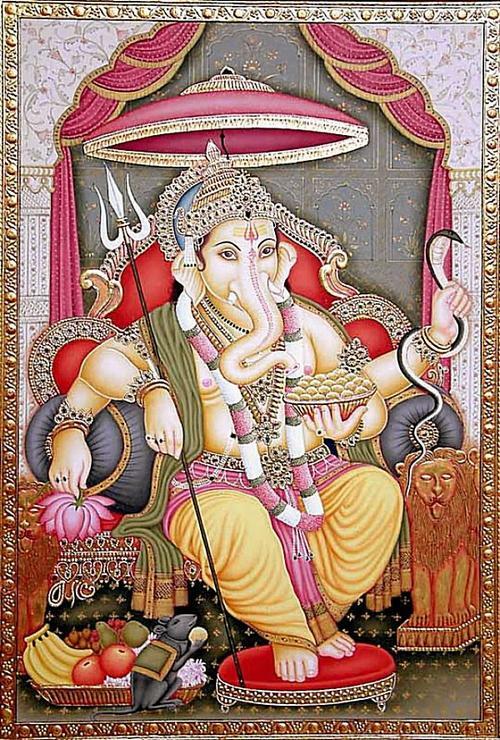 And, there was a deity named Dantin with an elephant – countenance (Hasthi –mukha) with a curved trunk (Vakratunda) In the Krisha Yajurveda (2.9.1163). 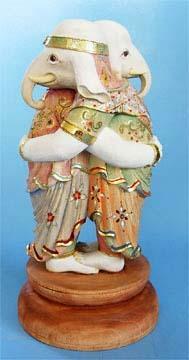 These varied forms , along with others, were brought together to combine into Lord Ganesha or Ganapathi. 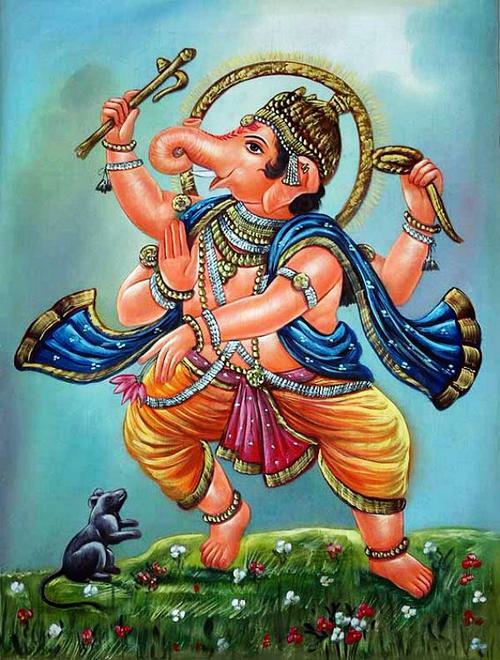 It is said; Ganesha emerged a distinct deity in clearly recognizable form in the 4th and 5th centuries CE, during the Gupta Era, combining in himself the features and virtues of the several of his Vedic and Pre-Vedic predecessors. 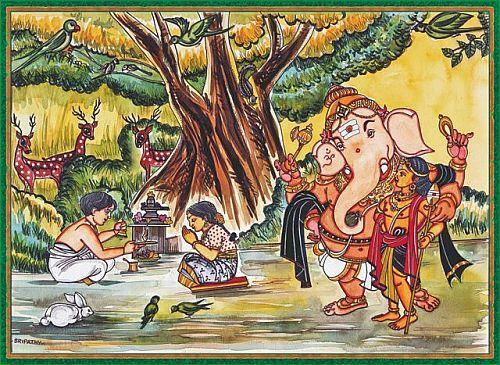 Ganesha Purana and Mudgala Purana are the primary scriptures of the Ganapathya –s. Both are described as Upa-Puranas. 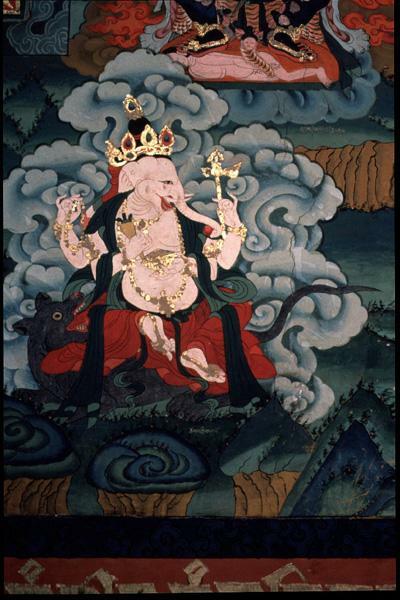 While Mudgala Purana describes eight incarnations of Ganesha, the other Purana, which perhaps is the later of the two, describes four of his incarnations. According to the narration in Mudgala Purana, Gajanana was the fourth incarnation of the Lord Ganesha, to slay the demon of greed, Lobha. 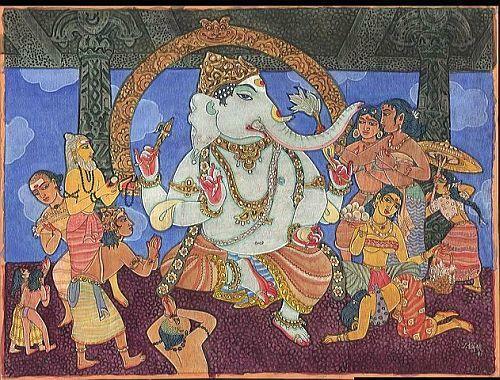 And, again during the 8-9th century Ganapathi was formally included among the five principal deities (Panchayatana). 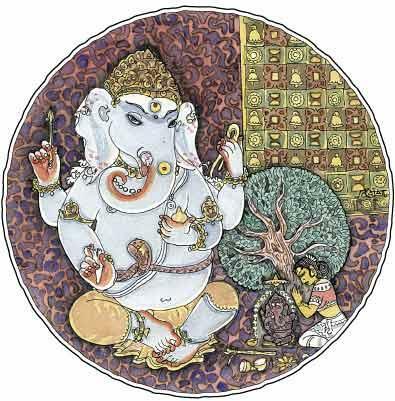 The prayer you cited “Gajaananam Bhootha Ganaadhi Sevitham” refers to Ganapathi as the darling son of Uma Devi; and as one who enjoys the essence (Sara) of kapitha (wood apple) and Jumbu (Rose apple) fruits, obviously relates to Ganapathi of the Puranas, which is after the 4-5th century. I therefore, feel, that the prayer mentioned you could not possibly belong to the texts of the period from fifth century BCE to Second century BCE. I am not sure if this meets your requirement. PS: I reckon that the Book Loving Ganesha might be interest to you. Please click here. Please do tell me what exactly do you mean by ‘ duplicate content’. Is it within the blog-content ; or is it in the Google-search ? Is this Ganesha mula mantra ? Which scripture mentioned this manta ? If this is not correct ,please correct it. 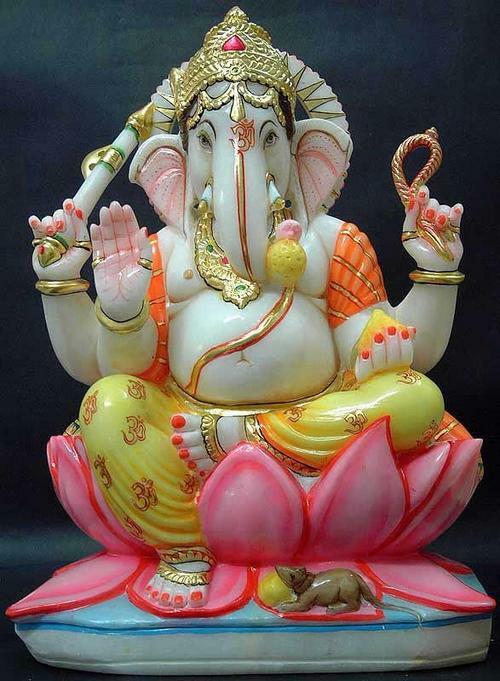 Dear Sir, can I ask please a question about Ganesha that I have. He is mounted on a horse. I note you have a picture on this website. I can not find any information regards the use of a horse as his mount. Thanks for the visit ; and , for the comment. 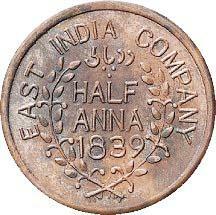 He is shown as riding varieties of animals and birds : rat; horse; elephant; lion ; peacock etc. He is also shown riding a bicycle; motorcycle; car etc; or even flying an aircraft.